The European Get Online Week is an annual digital empowerment campaign that engages and encourages people to use technology and the Internet with confidence and provide them with skills allowing them to benefit from the world of online opportunities. Supported by corporations, NGOs & public authorities, the campaign is organized each year in March by Telecentre Europe (TE), an umbrella organisation that represents European networks of ICT learning centres. Since its take-off in 2010, the Get Online Week campaign has reached more than 900.000 Europeans in more than 20.000 learning centres across Europe. Thanks to the campaign, more than 150.000 people have used the Internet for the very first time. 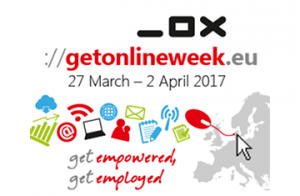 In 2017, Get Online Week is organized during 27 March – 2 April and challenges Europeans to learn, participate, share and create through th ousands of events and activities tackling the digital transformation and its effects. To learn more about the campaign and how you can get involved, visit the website http://getonlineweek.eu/.